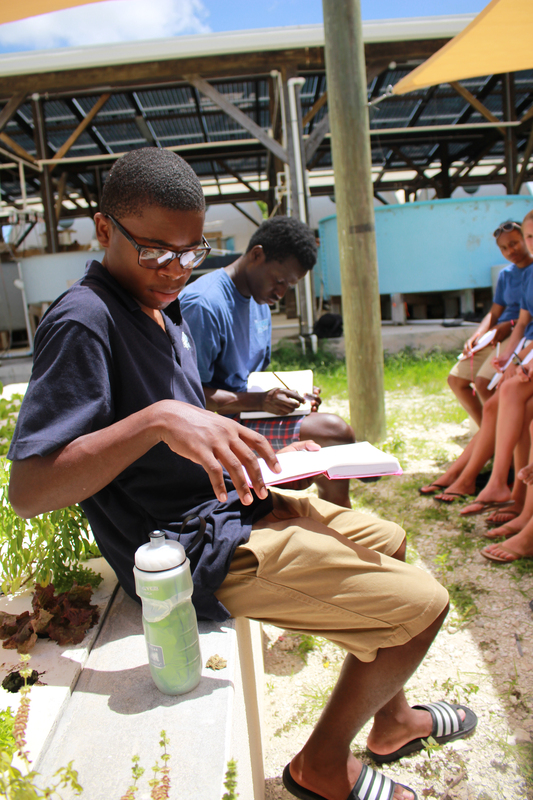 Recently, the Cape Eleuthera Institute supported the Bahamas Reef Environment Educational Foundation (BREEF) for their first ever BREEF Eco-Schools Youth Environmental Leadership Summit in Nassau. The Cape Eleuthera Island School is an important model for schools and businesses in the Bahamas on experiential education, sustainable development, and scientific research. Participation in this event gave the opportunity to share this knowledge with 70 students from eighteen schools in Abaco, Grand Bahama, Eleuthera and New Providence. CEI Environmental Educator and Outreach Coordinator, Tiffany Gray, was able to lead two sessions, one for primary students and another for secondary, focusing on team building, sharks and opportunities here in Cape Eleuthera. There was also a booth set up throughout the two day summit for more information on educational programs, summer camps, BESS, the Plastic Summit in June, and future employment opportunities. A notable announcement during the welcoming remarks came from Minister Kenred Dorsett, Minister of the Environment. He explained that the newly amended Electricity Act now makes it legal for the public to connect their houses, schools, and businesses, to the grid for credit through alternative energy! We have been doing this for years on campus but the fact that it is now legal is a huge step in the right direction for energy use in the Bahamas. The Preston H. Albury High School (PHAHS) Eco club, originally inspired by Kristal Ambrose, former plastic researcher and education coordinator at CSD, is working hard to become a green flag certified Eco School. Our continued support for this club gives DCMS alumni at PHAHS and former DCMS teacher, Will Simmons, much appreciated support in this endeavor. The summit was a huge success for BREEF and our participation played a pivotal role in the event. 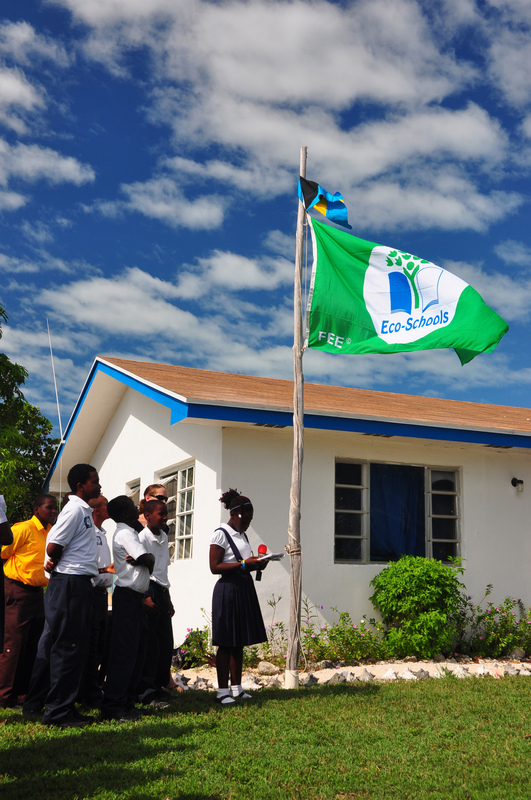 We look forward to collaborating with BREEF, PHAHS, and future Eco Schools in Eleuthera for the next summit in 2017! 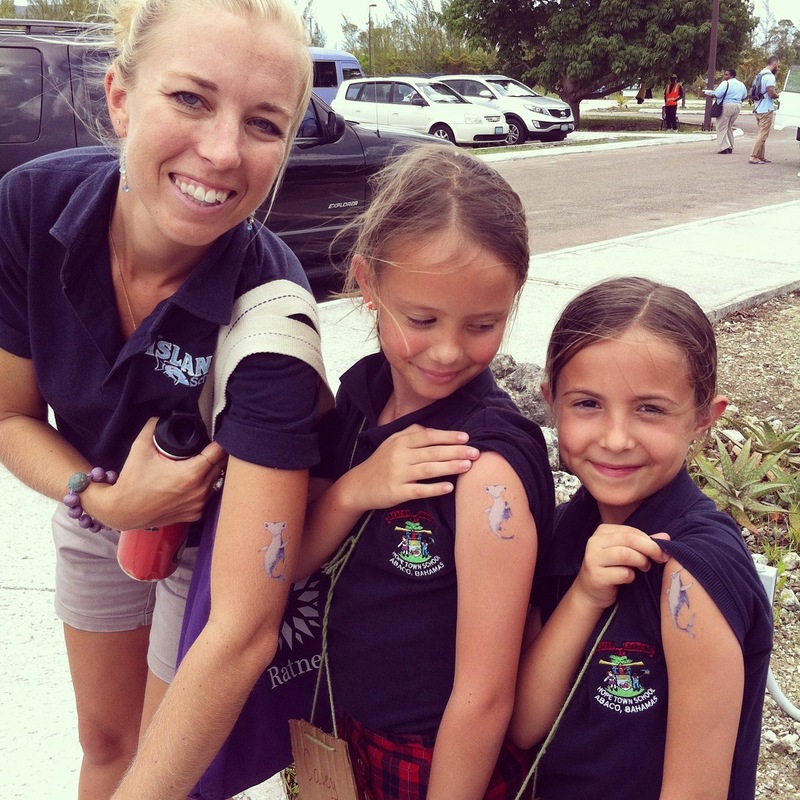 Tiffany Gray and students from Hope Town Primary School show off their shark Stanley tattoos. City Bridge partnerships connect inner city students to The Island School. We find that providing transformative growth opportunities to these deserving students, we expand their worlds while immeasurably enriching our own. The City Bridge program continues to inspire young people to make a difference and emerge as leaders within their home communities. This year, 67% of our total financial aid budget was allocated to support our City Bridge program. This summer, we welcome 10 City Bridge Scholars to our campus. Sahara is a passionate break dancer from Connecticut. 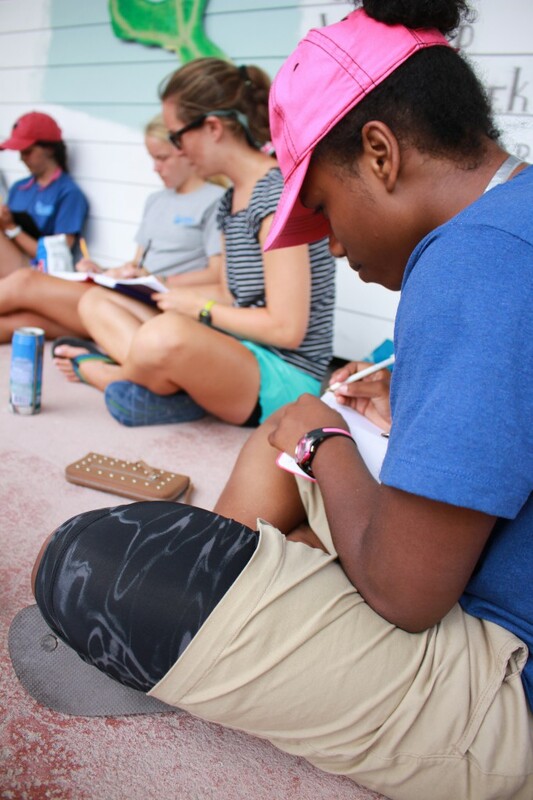 Her dedication and discipline to overcome challenges has lead Sahara to The Island School. The Tourism and Development course includes traveling around the island and several adventurous activities, such as jumping from a cliff into a Bahamian ocean hole and descending far into a limestone cave system. Her teachers have noted an amazing flash of emotions that passes over Sahara’s face – from a moment of stepping out of her comfort zone, to her grinning and bearing the challenge, and then to her enthusiastic “jumping in” – all in an instant. Sahara has been fearless at The Island School. Abraham joins us at The Island School from Ghana. This trilingual student is currently enrolled in the African Leadership Academy and was nationally recognized as the “Most Innovative Student in Ghana”. He has already established himself as a leader at home by founding and managing a self-sustaining student-run poultry and rabbit farm in Ghana. Abraham’s farm helps fund a NGO he founded, “Reach the Children”, which provides school infrastructure and supplies to underprivileged students near his home. At The Island School, Abraham hopes to gain more skills on how to establish environmental protection policies in his home country. His teachers have all noted his ability to step up as a leader on campus and have been impressed with his dedication to learn to swim while taking detailed his field notes in Marine Ecology class. Adrian’s first trip in an airplane was from his home in San Francisco to Eleuthera for our Summer Term program. In San Francisco, Adrian’s life is centered around basketball, school and church. He is strongly committed to community service and has helped build a prenatal center, works at his local food back, and even started a petition for Darfur. 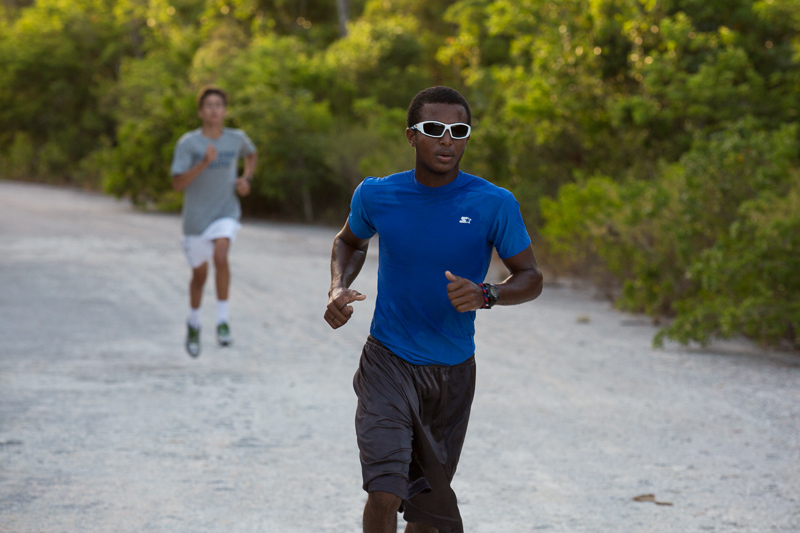 Adrian has carried his ability to care for others with him to Eleuthera. All of his teachers have expressed that he is perfect example of how to be a community member at The Island School. Celeste is a native Bahamian from Long Island. As a role model in Long Island, she received the Governor General’s Youth Award for her outstanding talents in science and desire to understand the world around her. Her current teachers at The Island School describe Celeste as a future marine biologist who helps provide a strong local perspective in class. She is continuing to learn more about her world underwater as she dives for the first time ever! Coming from New York City, Elijah was eager to jump right into things that were completely unknown to him. As an aspiring marine biologist, Elijah was especially excited to scuba dive and learn more about the world underwater. At home, Elijah is a dedicated community member. He tutors middle school students and provides entertainment and activities for residents at a senior home. At The Island School, Elijah redesigned a plot of land on campus to include edible plants and a Hibiscus arrangement spelling “Summer 14″. Rebecca is an exemplary Bahamian student from Abaco who has earned a government sponsored academic scholarship to attend Acadia University in Canada. When in high school, Rebecca developed her passion for the science and hopes to contribute to current research on alternative energy sources. At The Island School, Rebecca brought a unique local perspective to discussions on fishing and marine conservation. She is especially excited to bring her permaculture site design back home to her mom. 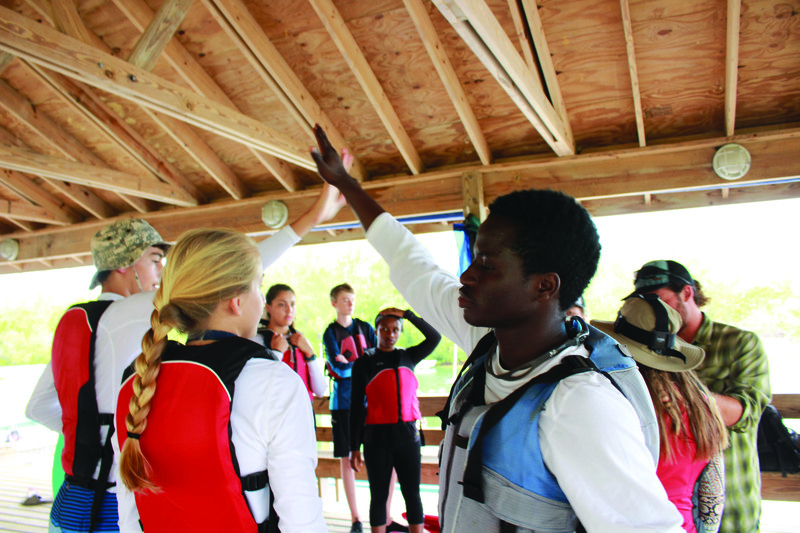 Rebecca left The Island School a few days early to compete in a Judo Championship in Florida. We wish her the best of luck! Kaven’s journey to The Island School began when he left his small hometown in the Dominican Republic to pursue better educational opportunities in NYC. Kaven’s curiosity in his academics have led him to want to pursue a career in engineering. At The Island School, Kaven is the most enthusiastic student during early morning circle and greets everyone with a warm welcoming each day. Loth has made the long journey to The Island School from his home in Tanzania. In the wake of his father’s passing, Loth has stepped up to assume family responsibilities for his 8 siblings. While caring for his family, Loth also serves as an African Leadership Academy Global Scholar Ambassador with an avid passion for aviation engineering. At The Island School, he continues to push his curiosity and challenges himself to do things he has never done. 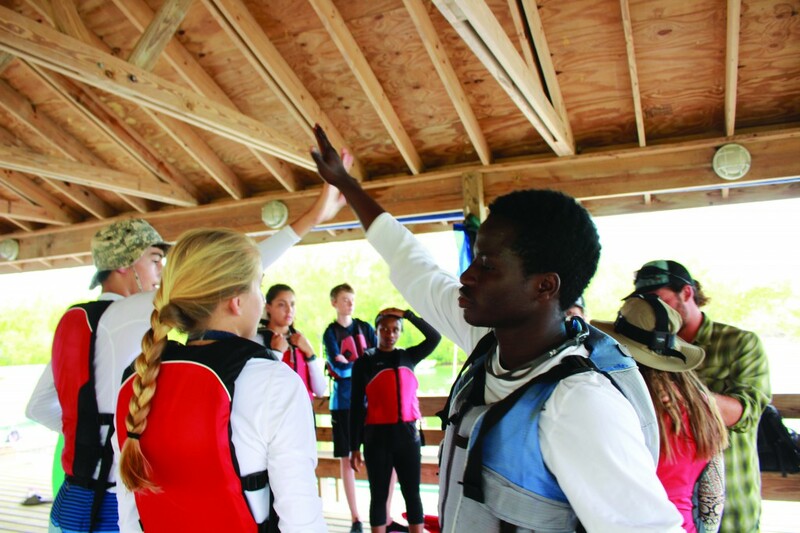 His teachers use swimming as an example of his determination: having never been in clear water, Loth continues to push himself to learn to swim, snorkel, and enjoy the marine environment around him. Marquis is a local student from the island of Inagua. 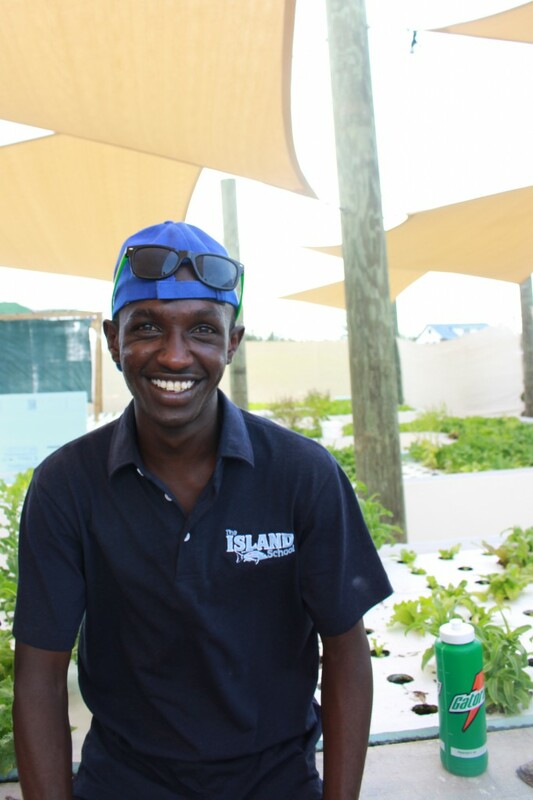 He has grown up working on his grandfather’s farm and volunteering with the Bahamian National Trust. At The Island School, Marquis is learning more about these skills and how to care for the environment around him. He has been an invaluable voice in his class discussions with his personal knowledge of the Bahamian culture and local plants. 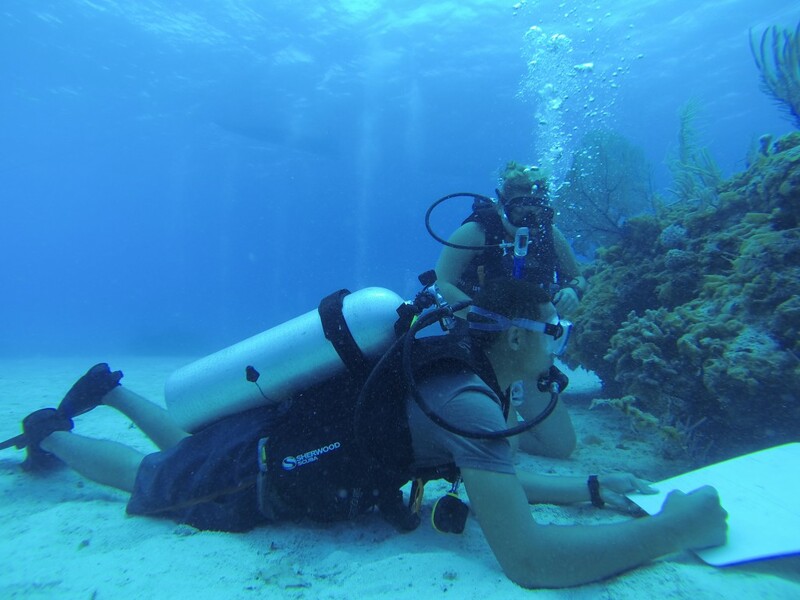 His comfort with classroom materials and topics allows Marquis to take the lead and guide his peers to dive further into the local Bahamian environment. Malik is a student who is constantly pushing himself. As a young boy, he would steal his mom’s friend’s law school books which has giving him his own desire to become a lawyer. He has challenged himself to play basketball at a higher level, plays chess against himself, and is teaching himself guitar! He carries this dedication with him at The Island School. He was the first leader of the day to be chosen by his classmates. He has been noted to be one of the most welcoming students and makes an effort to explore every person within community. If you are interested to learn more about the City Bridge program, please contact Mary Assini at maryassini@islandschool.org. If you would like to support our City Bridge program, please visit our giving page here. To mark their continued relationship of support, AML Foods, through their Solomon’s Fresh Market Brand presented the Bahamas Environmental Steward Scholar program (BESS) with a $5,000 donation. Renea Knowles, Vice President of Marketing and Communications for AML Foods, presented the check to a grateful group of scholarship award recipients and partners, which included Franchesca Bethell and Cristina Roberts 2012 BESS students Trueranda Cox, (BESS alumnae 2010), Garneisha Pinder (BESS alumnae 2010), Charlene Carey, Environmental Educator at BREEF, and Kalin Griffin, Chief of Staff at The Island School. Two Island School and BESS alumni, Bradley Watson (F08) and Garneisha Pinder (F10) have been given the opportunity of a lifetime to travel to China for 6-weeks to study biogas production at the BIOMA Institute. After the Chinese Ambassador to The Bahamas, Hu Shan, visited The Island School for the opening of Cape Eleuthera Institute’s Hallig House, he offered for two Bahamian students to travel to China to study biodigestion with all expenses paid by the Chinese Embassy. Below are some of Bradley’s initial thoughts. Check back in a few weeks for another update from China! On my return from a semester of studying Buddhism and Plant Taxonomy at the College of Charleston I received an email offering me an opportunity to go to China and study Biogas production at the BIOMA institute. At first I was filled with disbelief and then excitement took its place. This course that the Chinese Government offered for two Bahamian students would include people from other developing countries like Dominica, Columbia, Ghana, Niger, Venezuela, Nepal, Tanzania, and others. The last time I heard about biogas production was at the Island School while I was mentoring students during its first summer semester as the first stages of their bio digestion project began. The first time I was exposed to the concept of producing methane gas from organic wastes like sewage and agricultural by-products must have been in some documentary or reading that is now only a foggy memory. I had no idea that I would get a chance to gain a technical understanding of how these systems work from such seasoned practitioners as the professors of the BIOMA Institute who had taught 47 of these courses previously. With my goal of improving the sustainability of the Bahamian lifestyle in mind I could hardly imagine all the benefits of two young scientists being exposed to such a program, and for 56 days! 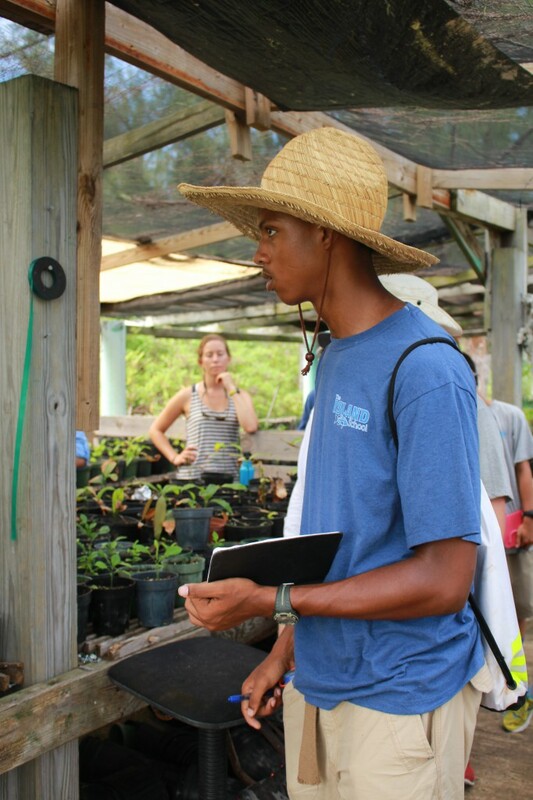 This fall, 2 BESS (Bahamas Environmental Steward Scholars) students, Brian Higgs (F’11) and William Sturrup (F’11), attended The Island School. 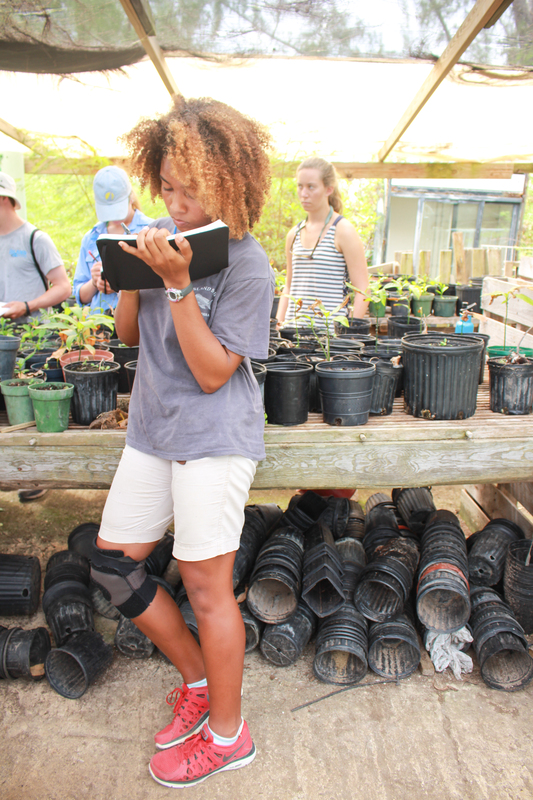 Now, this semester, as part of their full year BESS scholarship, they are interns at Bahamas National Trust and BREEF (Bahamas Reef Environmental Educational Foundation), respectively. Brian and William recently went on a two-week expedition, tagging turtles throughout The Bahamas. You can read about their trip here: BESS Newsletter. Prince Harry’s Visit to The Bahamas! Prince Harry, during his recent visit to The Bahamas in celebration of the Diamond Jubilee of Queen Elizabeth II, held a Youth Leaders Luncheon for a select group of outstanding students chosen for their exceptional leadership skills. Those in attendance represented several organizations throughout The Bahamas including three Island School alumni and one DCMS student were present at the luncheon. IS alumnae and BESS scholars Alannah Vellacot (F’08) and Truranda Cox (S’11), IS alumna Aly Boyce (F’10), and DCMS student Moesha Leary were among the lucky few to meet Prince Harry last week. They had the opportunity to discuss environmental initiatives with the Prince and had a great time! Yesterday The Bahamas Reef Environment Educational Foundation (BREEF) and The Ministry of Tourism organized a ceremony to recognize Deep Creek Middle School’s achievement of Green Flag certification. Green Flag Certification is an international recognition, which is awarded to eco-friendly schools committed to environmental education and performance. During the ceremony, Hyacinth Winder Pratt, Permanent Secretary of the Ministry of Tourism and Aviation, congratulated the students for being a game changer as the first school in The Bahamas and the region to receive such an honor. She also recognized their commitment as an important contribution to preserving The Bahamas’ number one draw for tourism, the beautiful beaches, clean water, and environment. She went on to encourage the students to promise that they would get their parents, neighbors, and friends involved with promoting sustainability. Also in attendance for the ceremony was Director of Sustainable Tourism, Earlston McPhee. “It is a great milestone that you’ve achieved. A small school of this size is setting the pace for the rest of the English speaking Caribbean,” said McPhee.